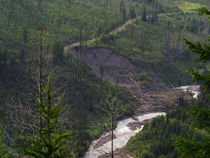 Swan Lake District Ranger Rich Kehr has announced breakneck biking “challenge features” will be removed from the Beardance and Crane Creek Trails this fall and next spring! This after hiking the trails on October 16 with his new recreation staff, trail volunteer Ron Cron, and Swan View Coalition Chair Keith Hammer. He deserves your thanks and your urging he remove ALL of them! 1. Thank him for finding breakneck biking “challenge features” like ramps and jumps must be removed from these trails to protect public safety and comply with trail objectives of being shared with hikers, horseback riders and other mountain bike riders. 2. Urge him to identify as “challenge features” and remove all log ramps not needed to cross wet areas already remedied by trail tread relocation and rock work. Only three of the many log ramps are actually needed as bridges for foot and bike over wet areas. 3. Thank him for restoring the upper two miles of the Beardance Trail to its historic location, rather than shifting use to an old road infested with weeds and not cleared of fallen trees. Click here to read the Bigfork Eagle article about his decision. 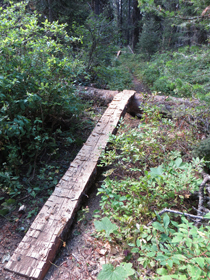 Click here to read Swan View Coalition’s request that Ranger Kehr clarify which log features will be retained to â€œprovide trail passage over wet areas.â€ Our letter PDF includes a 25-photo array that provides the big picture of what went awry on these trails, in violation of “tread lightly and leave no trace” ethics. Ranger Kehr has sent the message breakneck biking ramps and jumps can’t be built at will nor interfere with the use of trails shared by hikers, horseback riders and other mountain bikers. Your email to him today can help insure the line he draws is clear and need not be revisited time and again on Crane Mountain and elsewhere!